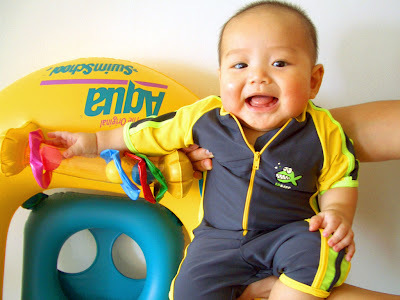 We bought Ethan a new swimming wetsuit and he looks soooo cute in it. This photo doesn't do his new sporty outfit justice! We got this from Kiddy Palace - it's their smallest one sized for 1 year old. Our tubby 6-month old baby fits into it with some room to grow! Now that we spent $26.90 (after discount) on this wetsuit, we are trying to maximize use of it before Ethan outgrows it. So this morning we took him for a quick dip before his morning bath. It's a bit colder in the morning so he wasn't laughing as much as the previous day! The wetsuit is really good! Not only does Ethan look very stylish, but he's kept warmer as compared with wearing only shorts. 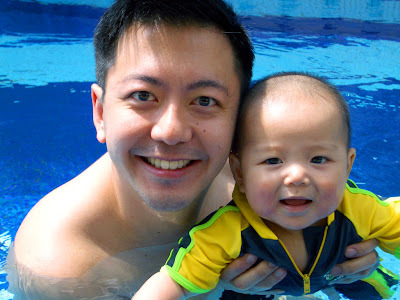 His favourite water activity is zooming around on his l'il speedboat!